What a pretty random wallpaper stencil or central design! This large, easy to use stencil makes decorating you home with that high end look easy and enjoyable. Floral stencils are so “in” and truly never go out of style. Use it as a random wallpaper, repeated texture or furniture design. Remember that all our plaster stencils can also be used with paint. 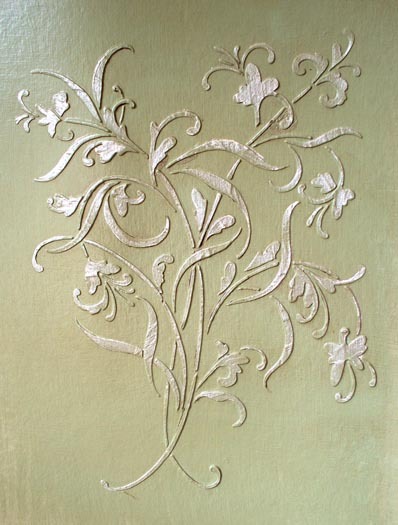 Using metallic paints on your raised stencil design gives a regal look to any room or project. And I love the look of “high end decorating”. Use it with plasters or paints depending on your personal desires. But want some real impact? Do as I did and plaster it over sage green walls, paint the design only with silver metallic paint, then rub darkly colored beeswax over the wall to bring out the depth of the design even further. Striking!